Peel the rind off an orange or three (here’s where the vegetable peeler from the fruitcake is so APPEALING). Toss the rind, the juice from the oranges, a few cinnamon sticks, a spoonful of whole cloves, and some chopped up bits of fresh ginger in a pot. Pour in a bottle of white wine and two bottles of red wine, and DO NOT BOIL but lightly heat that sucker for an hour or so. 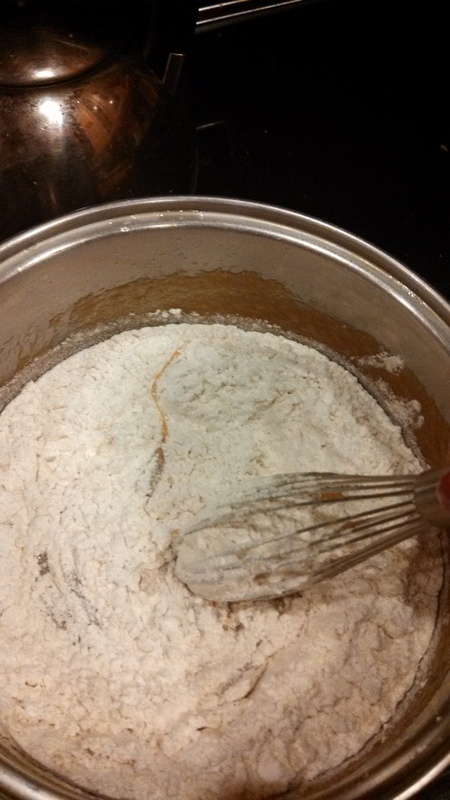 Stir in to dissolve a handful (1/3 cup or so) of brown sugar. Delicious hot, or with a splash of brandy! Okay, so on to the main event. I just started a recipe without pre-reading it (another thing NOT to do), and was stunned when I added FOUR CUPS of flour. FOUR. 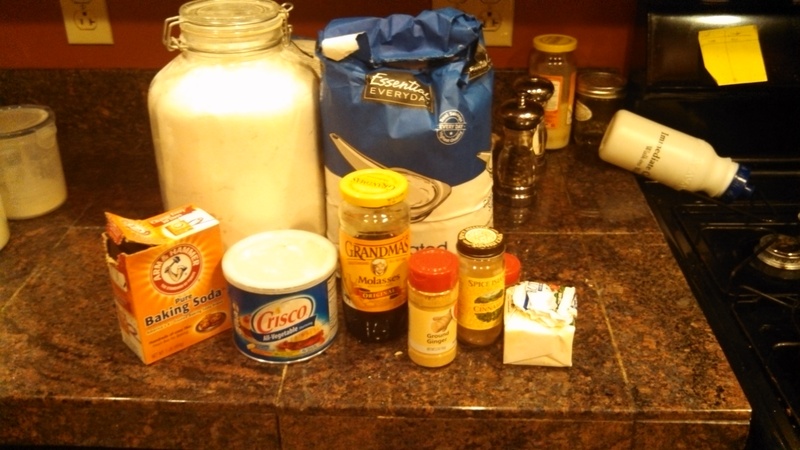 This recipe apparently makes six dozen cookies, which is many more dozen than I usual go for. Luckily I had all the ingredients (more or less…) in my pantry already, so no going out into this twenty-degree weather for molasses. First thing you do is melt the shortening. I ran out of shortening, so I used butter. Except I also didn’t have enough butter, so I threw in some applesauce too. I’m very precise with my baking, guys. 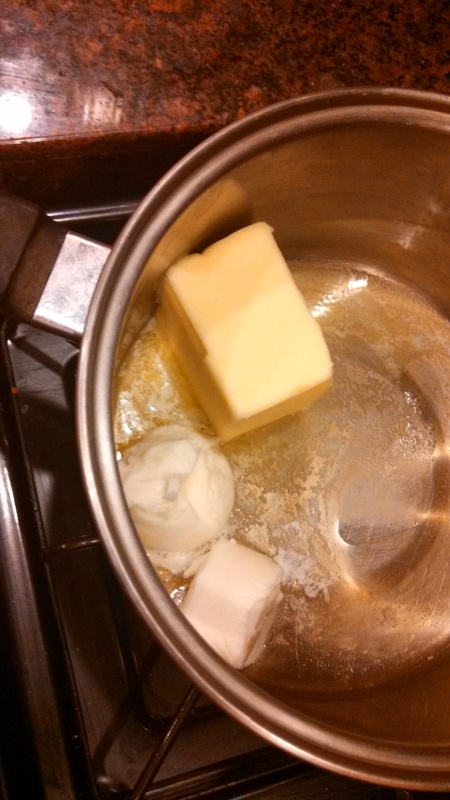 One cup of butter is half a block. The real question is, do you see the block as half empty, or half full? While that guy’s melting (don’t let your butter brown), whisk together your dry ingredients. 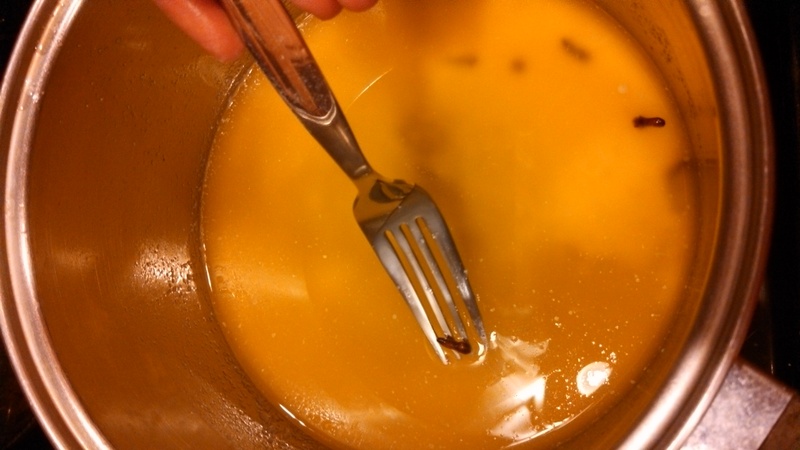 Once the fats are melted, fish out the cloves, and mix in your sweeteners and eggs. 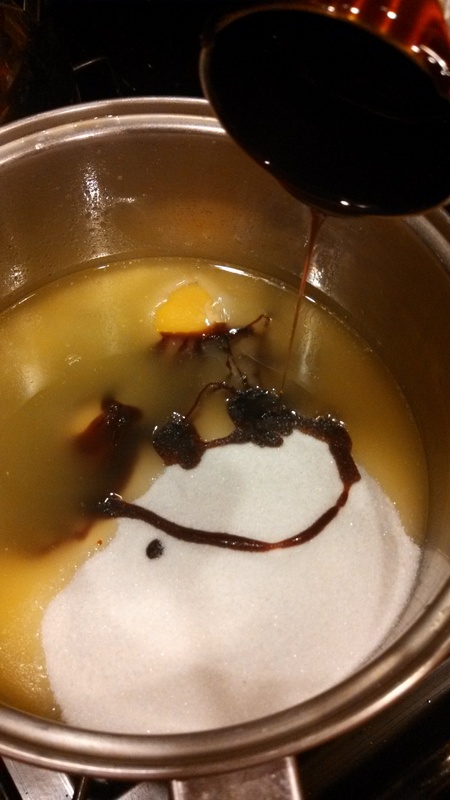 I tried to make a happy face out of molasses for you. No pun intended. Then mix those dry ingredients into your wet pot. The original recipe (from allrecipes) tells you to then throw this in the fridge for three hours. Clearly not going to happen with me. But I did chill the dough for half an hour while I cleaned up for the party. If you’re curious, this has a pretty good explanation for why one should chill dough. There’s a lot of discussions out there, but as far as I’m concerned, chilling makes it MUCH easier to work with cookie dough. Otherwise all that melted fat just gobs up everything and you drop all the dough and the cats eat it and then everyone is sad. SO. 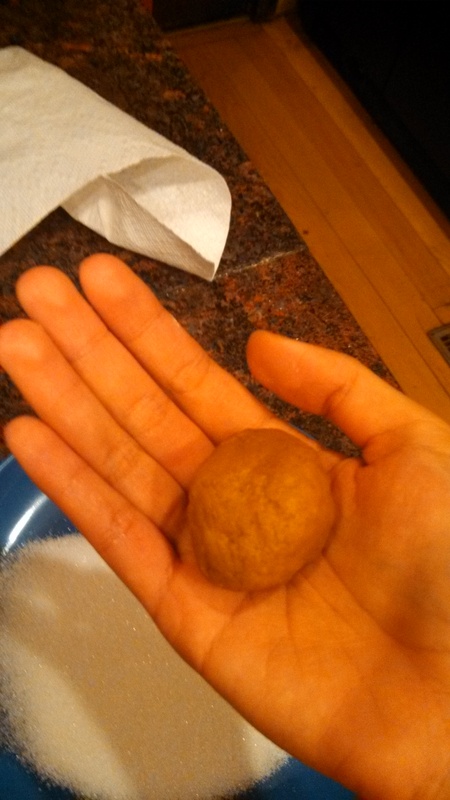 Once you’ve left the dough in the fridge as long as you can (it also keeps the cookies from spreading too much), you roll it into a ball, roll it in a plate of sugar, and put it on your silpat. A ball in the hand is worth two in the bu… wait. Wrong idiom! Tsk tsk, Yen. Gotta keep your EYE ON THE BALL. You’ll want to keep these guys a few inches apart because they spread like eagles. We ate all 70-some cookies in two hours of the party. They are SO GOOD. Make sure to bake EXACTLY ten minutes. 9 minutes, they’ll be too soft, and 11 minutes, too crisp. Ten gives a perfect slight crisp outside and gooey inside. By the way, that fruitcake is DELICIOUS AND ADDICTING now. Mix dry ingredients with wet, chill for three hours. 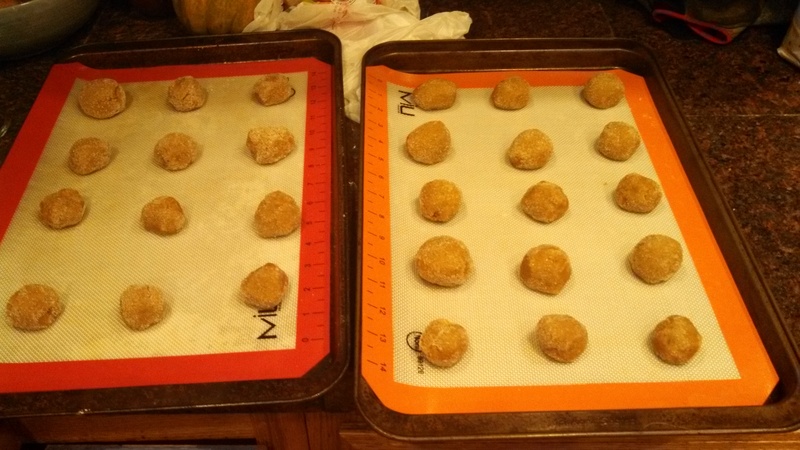 Roll tablespoons of dough into balls, then roll in sugar. Bake at 375 for exactly ten minutes.